CONS: He’s an emotionally detached, elitist snob with awkward social skills. BEST SHINING MOMENT: Singing Edelweiss at the Salzburg Music Festival. LEAST SHINING MOMENT: Whistling for his children as if they were part of a Pavolovian experiment. WHY I CHOOSE THE CAPTAIN: Lets face it, Captain Von Trapp is the the Mr. Darcy of the Musical world. He starts off aloof and disagreeable –the antithesis to our plucky warm, loveable Maria/Lizzie. He is so wrapped up in the constraints of upper crust Austrian / Regency Society that he is practically mummified. He is as surprised as any one else when a scrappy, country flower of a girl helps him unwind and find his voice again. This entry was posted on Saturday, October 12th, 2013 at 5:05 pm	and tagged with Broadway, edelweiss, Sound Of Music, Von Trapp and posted in Captain Von Trapp, Thought of the Day. You can follow any responses to this entry through the RSS 2.0 feed. I love this movie, but Meet Me in St. Louis is by far my favorite musical. The parents are so great–grumpy, lovable father and serene, secure mother. My father used to get teary-eyed (and he never got teary-eyed) watching Judy Garland sing Have Yourself a Merry Little Christmas. I LOVE writing about detached male snobs! The main character in my second book is one and he makes me laugh so much–though he wouldn’t think any of it is funny! Watching my kids sing Edelweiss at a school concert really tugged my heartstrings. 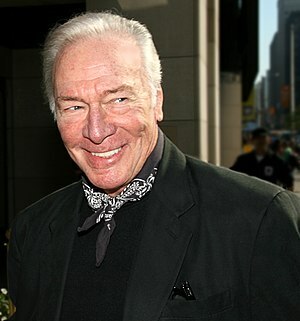 I’d forgotten how handsome Christopher Plummer was. Both Edelweiss and Have Yourself a Merry Little Christmas get me teary eyed too. Ahh the power of song.